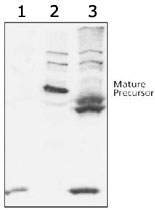 Western blot analysis of ABCG8 using ABCG8 polyclonal antibody ( Cat # PAB12501 ). Samples : mouse liver microsomes from G5/G8 knockout mice ( lane 1 ), wildtype human G5/G8 ( Lane 2 ), and transgenic human G5/G8 ( lane 3 ). Western Blot: ABCG8 Antibody - Western blot analysis of ABCG8, using anti-ABCG8. Samples: mouse liver microsomes from G5/G8 knockout mice, wildtype human G5/G8, and transgenic human G5/G8.